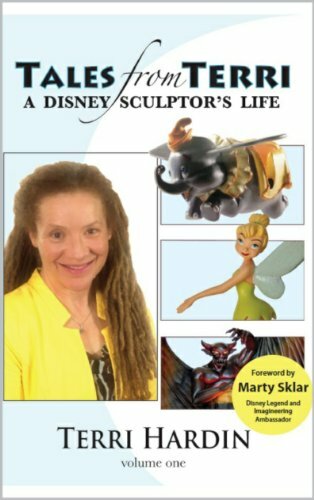 If you ever wondered what goes on behind the scenes at Disney regarding a collectable piece of art, then, you will want to know the secrets revealed by Terri Hardin, Disney Sculptor. This amazingly talented artist specifically outlines the details of the craft from inception of ideas to the Disney event releasing the limited edition pieces. Collectors of sculptors, art, collectables, and Disney will definitely want to read this edition. Terri's amazing talent extends beyond work for Disney including work for Captain EO with Michael Jackson and in the film industry with movies including ‘Ghostbusters’ (Ivan Reitman, Dan Ackroyd, Harold Ramis, Bill Murray, & Sigourney Weaver), Men in Black’ (Barry Sonnenfeld, Will Smith & Tommy Lee Jones), ‘Flintstones’ (John Goodman, Rick Moranis, & Rosie O’Donnell), and the Television Series ‘Dinosaurs.’ However, in this first of a series of four book products which will finally result in a hardback 4 book collectors set showcases Terri's intricate sculpting work throughout the process of forming the idea, the original sketch, the model, the mold, the finishing touches, and the determination of the final number of pieces. Her wit and optimism grace every page making this a pleasurable, yet, educational and informative read from start to finish. Disney lovers will cherish it. Art lovers will relish it, and people curious will fall in love with it. Additionally, the printed version of this 2nd edition is available in limited quantities in paper back through the publisher at www.TheREDCarpetConnection.com pending the release of the final cover still awaiting feedback from Disney collectors. If you want to be included in the review process or if you want access to information on the future releases, book signings, presentations, and more regarding this product and products like these sign up at www.TheREDCarpetConnection.com. Additionally, this special limited 2nd edition is the first edition to include the foreword by Marty Sklar who spent half a century focused on creating Disney's Magic Kingdoms including Tokyo Disneyland, the Disney-MGM Studios, Disneyland Paris, Disney's Animal Kingdom, Disney California Adventure Park, Tokyo DisneySea, the Walt Disney Studios Park and Hong Kong Disneyland.